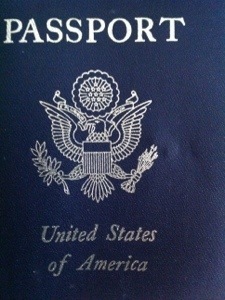 After 12 years of constant interaction, my passport is a familiar sight. Until a few weeks ago that familiarity lulled me into forgetting the importance of my proof of identity and my permission slip stuck inside. My husband’s passport went missing and the hoops we jump through right now to get a new one…well…let’s just say we planned to do other things with our summer. Instead he looks forward to multiple days carrying papers around that prove his identity so he can one day receive back official proof of his citizenship and permission to live in a foreign country. Most of the process involves just showing up at the right place with the right paperwork so the official with the big red stamp gets the pleasure of bringing it down with force on the properly filled out forms. Some things go missing and I give them up quickly as lost. Other things I turn the house upside down for like those gold earrings I misplaced for a time. When I lose things I closely retrace my steps in my head. We lost a fancy camera at the airport once and I didn’t notice for a week. I gave it up for lost with a sad heart but still checked when I took another flight that next week. I received it back from lost and found with tears! Some things come back. But the passport never came back. We looked and looked. We asked. People helped us. We reluctantly returned home. Then we called from home. Then he went back to look himself. Security officers showed him the surveillance video and he discovered why we never found it. Someone took it off the floor where it dropped minutes after it landed. A man ignorant of its importance or purpose. A man who stood to gain nothing from his theft while it costs us much. Our hope that it slid under a trash can vanished. We lived through the time to search and entered the time to give up for lost. Trading stories this past week with friends about things lost brought a smile to my heart as I saw more clearly. In searching, in wading through bureaucracy, in looking for things lost I share in the things of the Lord just a bit. An understanding enters my heart. He searches too. He searches for people…he seeks to give a regal identity to the lost. He searched for me. I do long for the day when passports and visas and proof of citizenship fade away but for now I remind myself of the importance of contemplating things lost as I fill out yet another form or look up yet another important address. He searches for the lost. What is it about our names that we feel the need to carve them in things? Wet concrete. Bathroom stalls. Trees. The Luxor temple . Names etched all over the world prove the reality of our experience and existence. At least we hope they do. I carved my name on the world one time. After my first two years overseas I wandered my campus, the campus where I learned to speak an incredibly difficult language, and remembered the moments of my presence. I purposely journeyed and recalled first days in class, first friends, and my purpose in undergoing such trying two years. Towards the end of the journey I used my key to carve my name in a bamboo grove near a favorite meeting spot on campus. A key is an unwieldy tool for carving a name. My name etched in a particularly fat bamboo pole stared at me in all its amateur ugly but it stuck in there solidly white in a background of green. I took no picture of my name but it looked worse than this one. Carving my name felt permanent. I know now that bamboo is grass. Bamboo grows fast. Super fast. People cut it down to use as scaffolding or to hang laundry on to dry. It floors houses because of its eco-friendliness which rests in its ability to replace itself and fast. Did I say it grew fast? Bamboo can grow a few feet a day which is why people feel not the least sad to hack it down. Hardly the kind of media to use when one tries to make a permanent mark in the world. But bamboo possesses a strength which makes it suitable for many tasks. Asians love bamboo. They sleep on it, eat it, eat from it, hang clothes on it, paint on it, paint it, carve it, write poems about it, feed it to pandas, and build walls using it. If ever a perfect plant existed for such a numerous people, this might be it. After 12 years in Asia I understand the Asian love for bamboo. 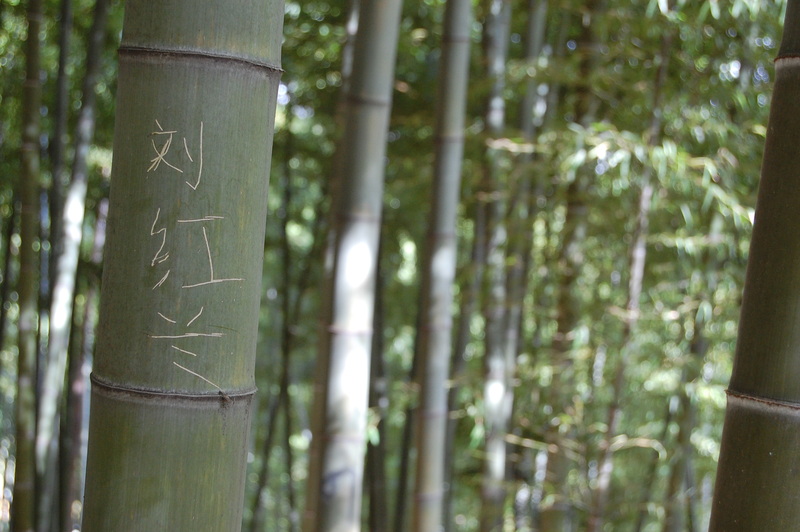 My name long since grew up and out and over that bamboo grove. My permanent mark proved anything but permanent. But the task of marking my name on something stays with me. The fact that I chose bamboo of all things seems significant. 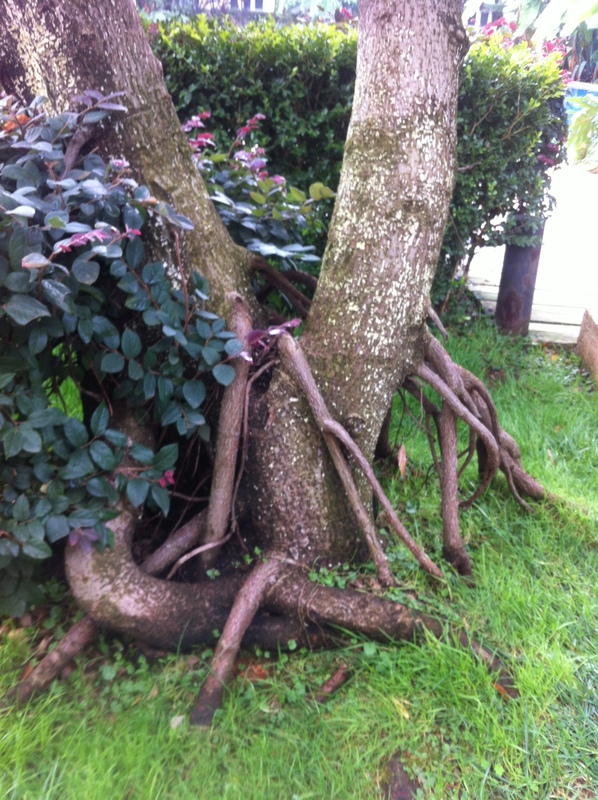 It reminds me of the strength that comes not from being brittle and hard and tough but from growing from a strong network of roots connected to the Source. I think about the way it grows so fast and hope that I, too, grow in season. Bamboo sways and whispers and sings. I hope my life also sings a melody of God’s grace as I live among others. Have you carved your name on something? What significance does it have for you?